We have attended many games, many events and many parties and we have to say the sheer amount of parties and celebrities all in town for Super Bowl week may be at an all time high all over the city. Every night has been nothing but parties and it surely is not going to stop leading up the the Big Game on Sunday. So after arriving on Sunday and trying to forecast our week of what might be the best events to hit. Well here is a recap so far of what we were able to find happening all over the city. Blue Martini in North Scottsdale hosted a PGA Phoenix Open party that packed wall to wall until 2am. Some of the notables that attended were Odell Beckham and Ben Roethlisberger. 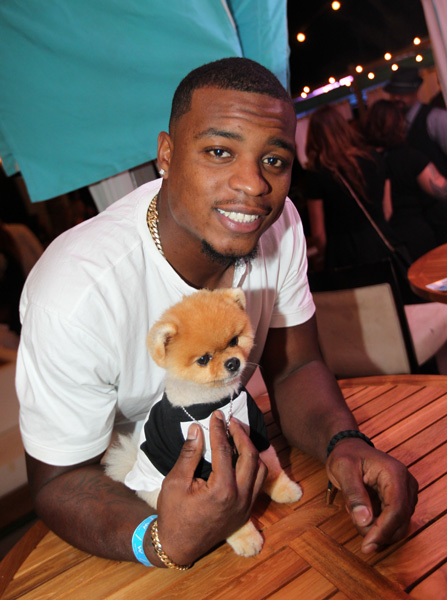 Tuesday night seemed to have the action turn up just a little bit across town in Downtown Scottsdale with the Players and Pets event at Boondocks. This is an event that we have taken part in prior and tonight was no different. In what was one of the more attended parties on a Tuesday night that included PGA Pro Bryce Molder, USA Ski Team Member and X Games Veteran Krisi Leskinen, Geoff Schwartz from the New York Giants, LPGA Golfer Blair O’Neal and former NBA Center Jahidi White just to name a few. Unlike many of the other parties during the week, this one was to benefit HALO Animal Rescue and featured a fashion show with dog apparel and accessories from manufacturers such as Barbour and Jordan Brand. Celebrity dog, Jiff the Pomeranian was also in attendance. Wednesday nights spotlight was the Suits and Sneakers party at the W Hotel. Featuring a poolside fashion show and plenty of stars in their kicks. Stars spotted here included Odell Beckham Jr., who hosted the party, players from the Suns and the Wizards. Former Philadelphia Eagles quarterback Donovan McNabb as emcee, the suit-and-tie fashion show and party was a comfortable, if appropriately dude-heavy, way to ease into what will be a long stretch of parties. Other events included the very popular Wounder Warriors Football Game at Shadow Mountain High School which featured the Arizona NFL Alumni against the Wounder Warriors team with a little celebrity help from Snoop Dogg and the first female non kicker football player, Dr. Jen Welter. The Wounded Warriors kept their streak alive defeating the NFL Alumni. Downtown the concert Verizon Concert series kicked off with country duo Maddie and Tae, who seemed to have their fair share of people packed inside as well. Thursday and Friday kept things going with Jamie Foxx and Kevin Hart at the W Hotel and Saturday night has events from Drake and Kid Rock at the Birds Nest. So whether you are here for the game or here for the good time, there is certainly something for everyone.